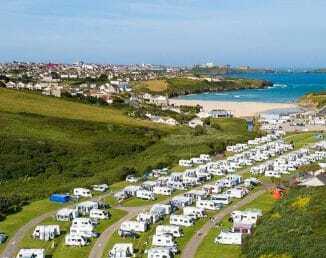 With over 200 touring pitches available, top class facilities on-site and a prime location on the north coast, Porth Beach Holiday Park is the ideal location for your rally in Cornwall. Primarily a family holiday park, our site also caters for rallies and has hosted dozens of groups over the years. Our location, close to the vibrant resort of Newquay, with its many spectacular beaches and amenities, means our site is a popular choice for rallies. Our expert team are on hand to look after your every need and, with a wealth of experience in hosting rallies and groups, we know exactly what organisers and participants are looking for! There’s plenty of space for your rally in Cornwall at our holiday park, with spacious pitches boasting great views of coast and country. You can choose from a variety of different pitches – ideal for caravans, large tents and even motorhomes – with electric, water, waste and Freeview TV hook-ups! Hard standing pitches are also available. From our site you’re just 5 minutes from Newquay. The town has 7 magnificent beaches, from the quiet and serene Crantock Beach at one end of the spectrum to the all-action surfing hotspot that is Fistal Beach. There’s a fantastic range of amenities in Newquay too, from countless shops, cafes, bars, clubs and restaurants to top class attractions such as Blue Reef Aquarium and Newquay Zoo. Our holiday park is only a short drive from the idyllic fishing town of Padstow. Here you can wander around the shops around the harbour or enjoy a meal in one of the many fabulous cafes and restaurants. The home town of celebrity chef Rick Stein, if you’re a fan of seafood then Padstow is certainly the place to be! Further up the coast is the pretty fishing village of Port Isaac, better known to many as Portwenn from TV’s Doc Martin. Here you can visit the ‘doc’s house’ and take in the many locations used in the popular comedy drama. Cornwall is blessed with some great attractions. And one of the county’s finest – possibly one of the most iconic in the UK – is the Eden Project. You’re only a short drive away from this popular attraction. Here you can marvel and manmade landscapes in the Rainforest and Mediterranean Biomes. A great day out! If visiting iconic landmarks is your thing then why not pay a visit to Tintagel Castle? Take a trip up the north coast to the legendary castle of King Arthur and learn all about the myth and legend associated with this spectacular place! 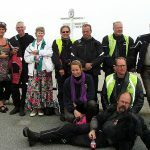 Here you can also take in the outstanding beauty of the North Cornwall coast, with other places on route including Trebarwith Strand, Boscastle or come in land and explore Bodmin Moor. There are so many great things to experience in Cornwall that your group may not have time to see and do it all (so you’ll have to come back time and again!). If you don’t want to venture far, however, then the village of Porth itself can cater for all your requirements, with shops, a great local pub and, of course a fantastic sandy beach just 150 yards from our holiday park! So, choose our site for your rally in Cornwall this year. Call us today on 01637 876531 or book on-line now!